My fiance is disgusted with the green water bottle in the fridge I use for any left over coffee in the coffee pot. Whatever’s left, I put in the green water bottle in the fridge to make cold brew for later. These bean bags allow for any coffee lover to make cold brew over night. All you need to do it place a bean bag in a pitcher of water and let it sit overnight. Each bag makes ten cups of cold brew. Flying Dog and Otterbein’s teamed up to create beers that match cookie flavors. After endless taste testing (very hard work), we enjoyed each brew and found that the pairings went very well together. This was one of my favorite beer pairings. Anyone that likes sweets and/or beer will enjoy a pack of the Flying Dog Beers and a box of Otterbein’s cookies. One of the best gifts I received was a nice $80 bottle of scotch. I savor every drop of that bottle. While I wouldn’t recommend dropping these into an expensive bottle of scotch, I would recommend these for a glass of knob creek or a higher end whiskey. Any whiskey/bourbon/scotch fan will enjoy these crafted wood whiskey sticks to add oak-aged flavor to your spirit. When you are drinking expensive whiskey or scotch, the last thing you want to do is water it down. Which is why Corkcicle designed this whiskey wedge which nearly prevents the drink from watering down. The design of the wedge is supposed to prevent the ice from melting and watering down your fine booze. Plus, it looks pretty cool. 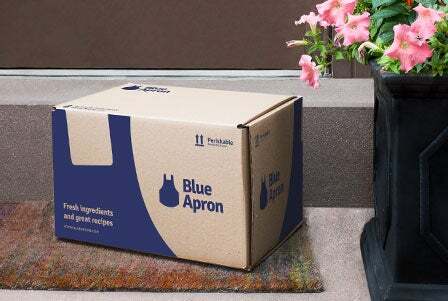 Blue Apron is delivering full meals to your doorstep – you just have to cook it. The company has various menus to choose from, allowing you to create even a week’s worth of meals without the hassle of going to the grocery store. This is a great gift for one of the people in your life that is too busy to shop but loves to cook. Get them a week’s supply and see how they like it. We went to the Philadelphia Christmas Village and could not pass up this stand while we were there. All of the sudden we smelled savory scents of garlic, bacon, and cheese. Brunkow makes various cheeses for us to choose from, but I recommend the brun uusto cheese. This cheese is baked ahead of time and sold in a square slab. Throw it on a frying pan, let it crisp up and enjoy. They have several flavors, but we like the original and garlic the best. The cheese is a creamy salty cheese that melts in your mouth. On the frying pan, you get a nice caramelized finish too. This is a cheese you can eat on its own. If you know anyone that likes cheese – this is the stuff. *Need more gift ideas? Check out our top ten stocking stuffers!